Cool Roof is a roofing system which can deliver high solar reflectance. That means that this kind of roof can reflect the ultraviolet rays of the sun, hence reducing the intensity of the sun’s heat to the building. In the past, these roofs were known to be white or any other light color. 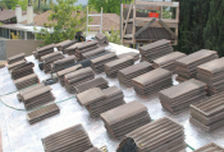 However, this has changed during the recent years due to the development of other cool roofing products. Currently, over 90% of the roofs globally are dark colored. Simply put, buildings with dark roofs consume more energy for air conditioning compared to a structure made using a cool roof. This leads to higher operating costs for property owners and a strain on the power grid. That’s why the use of cool roof materials is a technique for dealing with global warming that is growing in popularity. It doesn’t hurt that cool roofs also save money for the homeowner! Cool roofs don’t absorb as much heat, compared to other standard roofs. So the amount of energy you will need to cool your house will be reduced. You’ll save money as well as wear and tear on your air conditioning system! Apart from saving on money, you will also help in reducing the carbon emissions to the environment from power generating plants. 32% of the carbon emitted is from consumption of electricity. Therefore, with reduced demand for electricity, the amount of carbon in the air will also be reduced. With reduced demand for electricity in each household, there will be fewer cases of electrical outages. And maybe, with enough people adopting cool roof technology, the high electricity rates that apply during high demand season won’t be quite so high. Ultimately, you will be consuming less energy at a lower price. With reduced roof temperature, the life expectancy of your roof and cooling equipment in your home will increase. This will reduce maintenance costs associated with repair of the roof and the cooling equipment — leading to savings! You can easily have the comfort of staying indoors even without the use of an air conditioner, or without as much reliance on your A/C. If you are considering changing your roof, a cool roof is worth considering. It will not only benefit you as an individual but will also have positive environmental and economic impact. Contact us today to find out more about cool roofs and to get a free estimate! 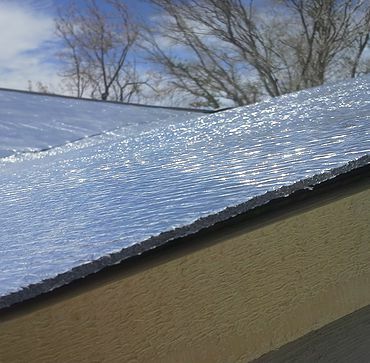 We are proud to offer Therma Sheet Roofing Underlayment to our clients. Call us for details on how it can help you. Reflects 97% of Radiant Energy. 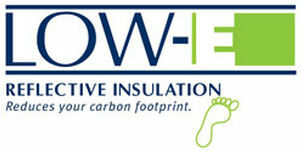 Even without an airspace, Low-E creates a thermal break and reduced temperatures on the underside of these roofing systems, when installed either under or on top of felt. © 2017 by ARIZONA'S FINEST ROOFING.